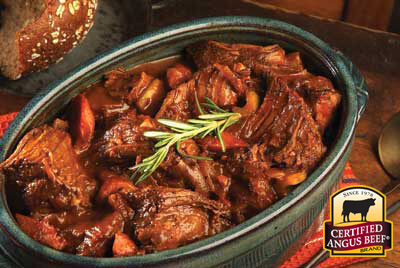 Beef Bourguignon is a classic French beef stew made with bacon, mushrooms, and red wine. 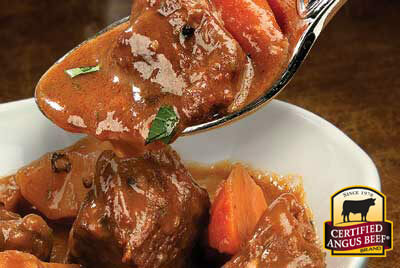 The beef becomes tender as it cooks in a delightfully rich sauce. In a large Dutch oven or skillet, cook bacon until browned. Remove with a slotted spoon and set aside. Season roast beef cubes with salt, sear in batches, not overcrowding the pan, over medium-high heat for 2 to 3 minutes in the bacon fat. 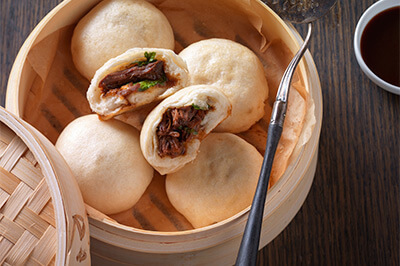 Set seared beef aside on a tray and sprinkle evenly with flour. Add a tablespoon of oil to the pan as needed and sear mushrooms over medium-high heat for 2 to 3 minutes. Add onions and thyme and sear an additional 2 minutes; softening onions. Add pepper and red wine. Stir and scrape browned bits from pan into the liquid; reduce wine by half. Return beef to the pan; add beef stock and bacon, cover tightly and place in oven. Braise for 3 hours until tender. 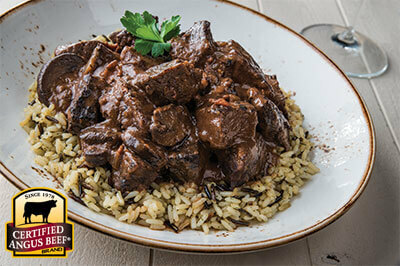 Serve Beef Bourguignon over warmed rice and garnish with parsley.